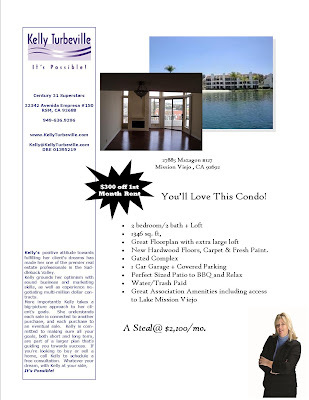 This is spacious condo located on Mission Viejo Lake has recently benn renovated with new Hardwood Floors, Plush Carpet and Designer Paint. Now it is just waiting for you to call it home!!! We are currently offering an attractive Move In Special of $300 off your 1st Months Rent, (O.A.C). Contact Kelly Today to Schedule A Showing, hurry won't last!